He was my father's "Father" until he found God for himself. 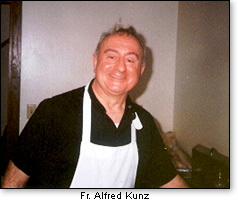 Years ago my aunt, the nun, apparently worked in the same parish as Father Alfred Kunz, a rebel Roman Catholic priest who performed exorcisms. They became friends, and like all friends of the Niblick’s at some point he was at the house with the family. Father Al admired my father’s art and invited Matthew out to work on his church in Dane, Wisconsin. What artist would deny the Church as a patron, not even Da Vinci? Just a few years later, my father dies in a tragic accident in the lonely hours of that pre-light March morning. Later, there would even be allegations that his murder could somehow be linked to evil in the most unthinkable of places: the vast Catholic hierarchy that Kunz was tied to as a diocesan priest. Some even blame the Vatican in Rome. In the absence of an arrest, the Kunz case also has developed into a religious Rorschach for many — certainly among those close to the case who consider themselves traditionalists within the troubled Roman Catholic Church, which all but invented the Easter holiday as Western civilization knows it today. Fifteen years later—March 4, MCMXCVIII—fifteen years ago today, Father Al was found murdered. The all-consuming rage at the cockeyed old priest; the uncontainable hatred, day after freezing winter day. The wee-hours confrontation in a dim school hallway outside the priest’s office, where he’d slept like a castaway for the past 31 years. The attack, the frantic struggle: It all ended in a heartbeat, when the killer plunged a razor-sharp blade into Father Alfred Kunz’s neck, slicing the major artery below his jaw. And then came all the blood — warm, slippery torrents of it, coating the painted cinderblock walls and the worn, gritty floor tiles. Almost instantly, Kunz fainted into a lifeless heap, his white T-shirt and black slacks soaked from the gaping wound. According to emergency room medical experts, he would have lived for about another minute, probably in a deep, dreamlike haze. Pedophilic Satanism in the bed of Roman Catholicism—the Vatican, otherwise known as the house of Babylon the Great—exorcisms, animal sacrifice, Luciferians; it’s a terrifyingly truthful tale entitled “The Devil and Father Kunz: An Easter tale about murder, the Catholic Church and the strange paths of good and evil“. Kunz had also traveled to Rome and met Pope John Paul II as the pontiff prayed alone one morning at a secluded Vatican chapel. Martin also repeated his belief that the aftermath of Vatican II was nothing less than a coup by Satanic forces – that, he said, was why he eventually broke with the church’s new mainstream after Vatican II. Martin wrote about the alleged dark influence often in his novels. In “Windswept House,” for instance, he described a satanic animal sacrifice linked by telephone to the Vatican’s Chapel of St. Paul – and the account does bear eerie similarities to a calf mutilation that occurred near Dane almost exactly 24 hours before Kunz was last seen alive. It’s been thirty years later now, and I wonder more than ever of the short days of my father on this earth. I find 33 a little young to feel so world weary, just look at all my father got in by 23. I had wondered about whether or not my dad had ever made it to San Francisco the year he hitch hiked across the United States to California for his summer vacation when he was 15. As I realize that he escaped from a Moonie camp, whose home base was in Boonville north of San Francisco out past wine country, it dawns on me, of course he did. And maybe one day I’ll make it out to Father Al’s church in Dane, Wisconsin, to see my father’s art, though I doubt it… I imagine it would be hard to concentrate with the image of the slain Father Al, hanging before me, throat cut from ear-to-ear, beheaded and bled.